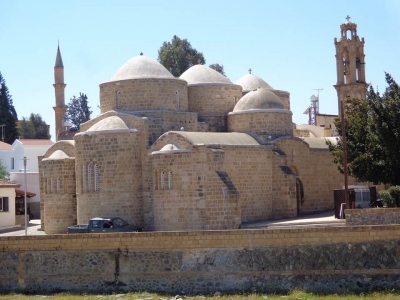 Agioi Varnavas and Ilarion at Peristerona (Five-domed churches) is part of the Tentative list of Cyprus in order to qualify for inclusion in the World Heritage List. Peristerona village is approximately 40 minutes west of Nicosia, on one of the roads to Trodoos mountains. The church of the Saints Barnabas and Ilarion was built at the tenth century with a Greek cross layout, each of the five sections being covered with a dome – from there the “five-domed church”. Front of the building was rebuilt in a much more recent period, and a bell tower was added then. The five domes can best be seen from nearby road bridge. Display on the door indicates the building is open on mornings and afternoons, but it was open all day long for prayers when we visited on Good Friday. We were the only visitors, all other people were coming to pray, and it gave a special atmosphere to the place. A few hundred meters from the church lay the remains of and old mosque – or better said a minaret in Ottoman style and ruins of a building. This area is fenced and cannot be visited. As for the other TWHS we visited in Cyprus, we enjoyed our visit at this very well preserved place, but we do not really think it will make it to the list of inscribed sites.